2) Australian Suicide & Bengala b Joe Lider & Pentagón Jr.
5) Myzteziz & Psycho Clown b el Hijo del Perro Aguayo & Texano Jr.
Mistica on Perro for the win, but the Hell Brothers and the Sociedad attacked the tecnicos post match. It does not appear the two groups were working together – Hell Brothers wanted Psycho Clown and Sociedad were left to unmasked Myzteziz. Oscar and Enrique have an audio recap, with run-ins by Perro Jr. & Myzteziz. This was the 3rd time Aerostar’s been in a Rey de Reyes match and the first time he’s won. They set up a lot of things for the first TV taping of the year. 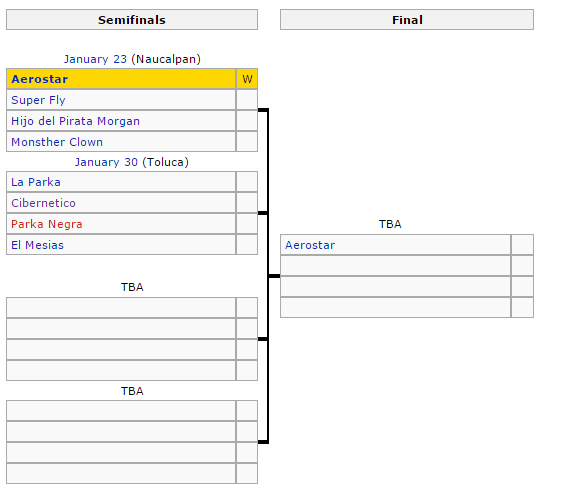 The Rey de Reyes final and Fantasma’s title defense seem locked in for the show. There’s hints of Psycho Circus vs Electroshock/Pirata Morgan/??? (vs Hell Brothers?) and Suicide & Bengala challenging for the tag team titles. It seems like the main even is more likely to be an all star tag than an Alberto title defense, but it’s still too early to be any sure. Pirata & Electroshock’s partnership was set up on a skit that aired as part of the DF tapings more than a month ago. The third guy stayed under a mask, but I’m sure I’ve seen his smile before. The Hell Brothers and La Sociedad are definitely meant not to be together, but it’s interesting to see them on the same general page after the whole “join or else” angle from Guerra de Titanes which never seemed to be resolved. No contender stepped forward to face Fantasma on this show. You’d be rich if you could bet on a cruiserweight title match being a multiman every time, but he’s specifically opposed by Fenix and Myzteziz on the next show. This also would be a decent spot to introduce someone from Lucha Underground. Ciclope is a long time DTU luchador, while Arez is one of the Indy-strong-ibles who’s been working for pretty much every promotion but DTU. In other instance where I was wrong, it appears people who worked these shows will definitely be headed to Lucha Underground. Aerostar’s already mentioned he’s headed to Los Angeles and others are likely going with. Missing a weekend now means missing a month of TV, so everyone who can be there needs to be there, even if it’s not as early as it used to be. Next taping is next Friday in Toluca. At the event, AAA announced they’d be back in Naucalpan w/Alberto next month. Presumably that’s a TV taping. We might find out about another TV taping on toady’s TV.